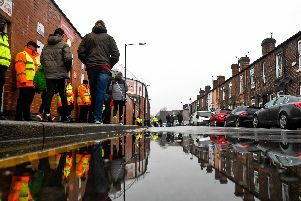 A Sheffield United supporter is calling on fellow fans to join him on a sponsored walk to Bramall Lane to help combat one of the UK's biggest killers. Mike Robinson will march 34 miles from Leek in Staffordshire to the stadium wearing his Blades shirt this June in aid of Prostate Cancer UK. The 34-year-old office administrator, who lives in Stoke but is a lifelong United fan, has appealed for more supporters to help form a red-and-white army walking to fund research into and improve care for people with the deadly disease. He took part in the Stoke leg of Soccer Saturday presenter Jeff Stelling's 400-mile March for Men last year, where he was inspired by a fellow participant who was given one year to live after being diagnosed with prostate cancer but was still here three years later and was running ultra-marathons for charity. Mike wanted to set himself an even tougher task this year, but the office administrator says he is not looking forward to the energy-sapping stretch through Flash, which claims to be Britain's highest village. "After last year's experience I really wanted to do something again for Prostate Cancer UK because it's such a great charity, and I thought it would be great to finish at Bramall Lane. "I'll be wearing my Blades shirt and I'd love it if we could get an army of United fans joining me in their shirts." Mike, who hopes to raise £5,000, plans to set off on June 9 at around 8am and reach the stadium at about 8pm that evening. Prostate cancer is now the third biggest cancer killer in the UK, ahead of breast cancer, according to Prostate Cancer UK, which says one in eight men will develop the disease in their lifetime. * If you want to join Mike on the walk, contact him @homerjay1889 via Twitter. To donate, visit https://uk.virginmoneygiving.com/fundraiser-display/showROFundraiserPage?userUrl=MikeRobinson20&pageUrl=1.